SAP S/4HANA Cloud brings the next wave of simplification and innovations across core business functions. It is the next generation cloud ERP designed with in-memory computing technology, and acts as a digital core, connecting the enterprise with people, business networks, Internet of Things, Big Data, and more. It offers all the effortless scalability, easy management, and complete security that is expected from cloud solutions. S/4HANA Cloud harnesses the power of S/4HANA while simplifying uptake vs. the on-premises version and eliminating internal IT requirements. It will help businesses become agiler and improve productivity. It also promotes cross-functional transparency and drives overall simplification and optimization of business processes. With end-to-end processes supporting finance, plan-to-product, order-to-cash, and procure-to-pay S/4HANA Cloud offer enterprise-ready functionality for digital businesses. 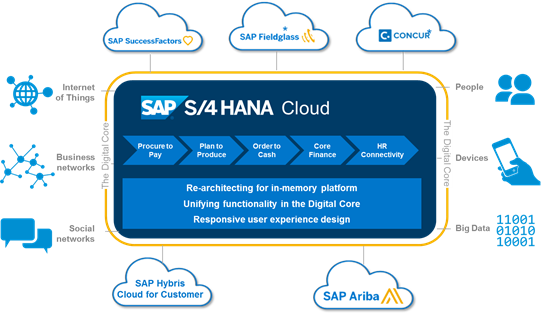 WHY MOVE TO SAP S/4HANA CLOUD? In this new digital age organizations need intelligent systems that eliminate redundant data and tasks, make predictive recommendations and learn from business patterns and employee behavior. With powerful analytics SAP S/4HANA Cloud makes ERP intelligent and provide instant insights and co-exists in a heterogeneous system set up with native integrations to other SAP solutions. SAP S/4HANA enterprise management Cloud has pre-configured content for core business processes like finance, procurement, manufacturing, and supply chain. Also, the SAP S/4HANA EM cloud offers SAP integration best practices for integration to other cloud solutions, such as Ariba and SuccessFactors Employee Central. The SAP S/4HANA Enterprise Management Cloud helps reduce the cost of operations by using standardized processes, manage multiple geographies, divisions, subsidiaries, and ledgers with global and country-specific content, as well as update and change customer specific configuration using SAP S/4HANA life-cycle management tools. SAP S/4HANA Professional Services Cloud manages the entire project cycle from one system to gain real-time visibility into project performance and profitability. It brings together business process and analytics in real time to be smarter, faster, and simpler; deploying the right resources to the right projects at the right time. The key business value of this commercial project management solution is the ability to integrate multiple processes starting from project creation, staffing and time recording, procurement, sales order processing and billing, to accounting and financials. An intuitive user experience helps in managing internal and customer projects by providing a comprehensive view of commercials, finance, procurement and the total workforce in real time. Staff projects intuitively and handle project monitoring tasks like drilling-down to project related analytics and KPIs (cost performance, work performance, economic analysis) with flexibility. Handle project review tasks such as recording project-related expenses and providing a single source of truth, with no aggregates. The SAP S/4HANA Finance Cloud provides pre-configured content for finance together with core sales and procurement processes. SAP Fiori supports these processes for a role-specific, intuitive, and simple user experience. To complement the business processes, embedded analytics and Fiori Overview pages add real-time insight into data. SAP S/4HANA clouds’ combination of technology and simplicity provides improved performance in orders of magnitude and has set a very high standard for competitors to follow. SAP S/4HANA Cloud offers the flexibility and scalability needed to meet today’s business operational requirements while discovering and capturing tomorrow’s opportunities.